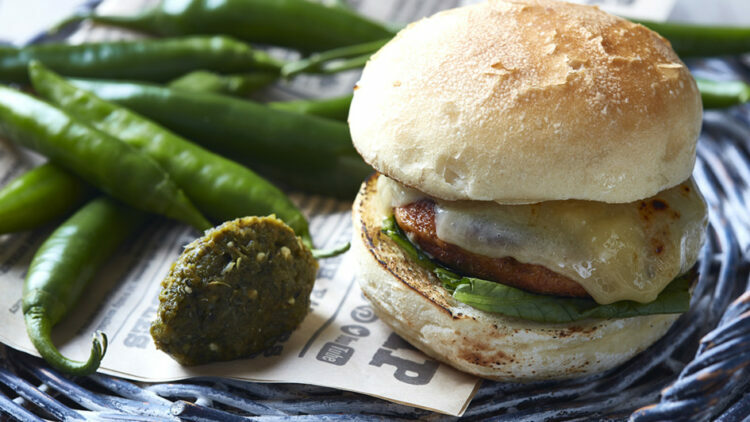 This Tofu and Veggie Burger is a lighter version of the popular burger but not light on flavour. Omit the cheese if you want to reduce the fat content further. Wrap the tofu in a cloth and squeeze out the liquid. Mix the tofu with the breadcrumbs, egg, paprika and season with salt. Form into 4 round burger patties of 130g each. Blister the peppers, spring onions and jalapeños under a grill. Blitz the peppers, spring onions and jalapeños along with the vinegar, garlic, water and maple syrup and season with salt. Fry the tofu patties in a little oil for about 4 minutes each side or roast in the oven until the core temperature is reached. Place some sliced smoked cheddar on the patties and melt under the grill as you toast or char-grill the buns. Place the tofu patty in the bun along with the hot sauce.